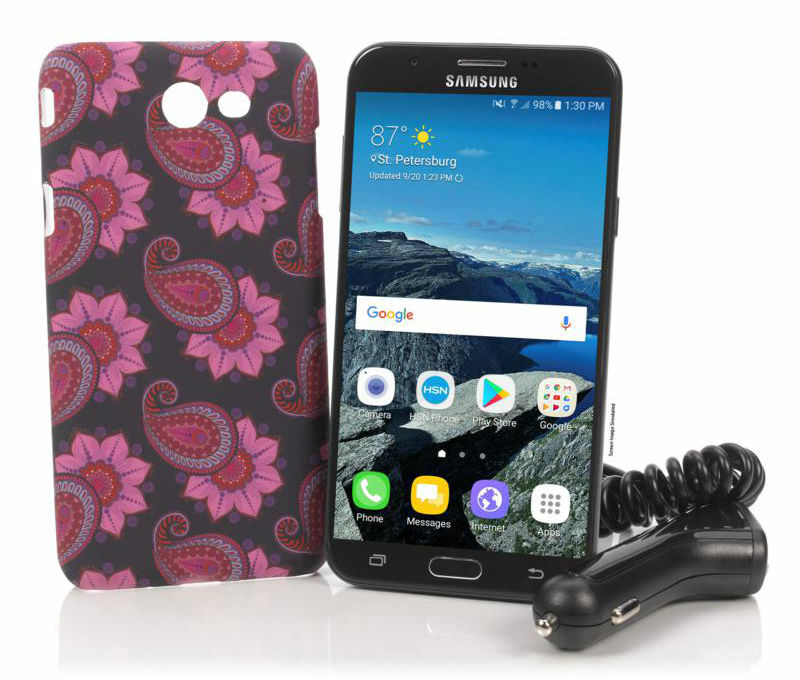 This week's Deal of the Week is the TracFone Samsung Galaxy J7 Sky Pro 16 GB LTE Android phone with 1000 minutes, texts and MBs of data, 6 months of service, case and car charger for $79.95 at HSN. Shipping is free. Update 12/29 sale has ended. The phone operates on the Verizon network, runs Android 6.0 Marshmallow and has a Snapdragon 425 SOC, 2 GB of RAM, 16 GB internal memory (10.4 GB usable), a 5.5 inch 720x1280px TFT screen, SD card slot and a removable 3300 mAh battery. There's an 8 MP main camera with LED flash and autofocus and a 5 MP front facing camera. If you aren't a fan of purple paisley, the case is also available in a variety of solid colors. The phone uses TracFone Smart Phone Only airtime and is not a triple minute phone. That's unfortunate as triple minute is less expensive for light use. But TracFone is phasing out triple minutes phones, which are getting hard to find, although HSN still has the triple minute Samsung Galaxy Luna for $79.95 with 1200 minutes, texts and MBs of data and one year of service. However, the Luna is an older, much lower spec phone than the J7 Sky Pro. I consider the J7 Sky Pro to be TracFone's best mid-range Android phone. It has a list price of $149.99 and the airtime is worth about $50 so this is a good deal if TracFone works for you. If you are committed to TracFone and want a little more airtime and twice as many days of service, HSN has the same J7 Sky Pro phone for $149.95 with 1200 minutes, texts and MBs of data and one year of service. 4 Lines of $50 Unlimited Gigs Plan for $100 ($110 with Todo Mexico) Family plan promotion. New activations only, at least one line must be a port-in from a non-Sprint based MVNO or operator. 4 or fewer lines $100, 5 lines $130. Ends 1/4. Free and Discounted phones for port-ins: LG Fortune Free, ZTE Overture 3 Free, CPO Alcatel One Touch Flint 99¢, CPO ZTE Sonata 3 99¢, CPO Alcatel Streak 99¢, CPO Alcatel Pixi Theatre 99¢, CPO Samsung Galaxy Sol 99¢, CPO Alcatel Pixi Theater 99¢, CPO HTC Desire 520 99¢, CPO HTC Desire 625 99¢, CPO LG Risio 99¢, CPO LG Spree 99¢, LG Harmony $9.99, Samsung Galaxy Amp 2 $19.99, LG Stylo 3 $29.99, Alcatel PulseMix $39.99, LG X Charge $49.99, Alcatel Idol 4 with VR Goggles $49.99, Samsung Galaxy Halo $49.99, Alcatel Idol 3 $69.99, ZTE Blade X $69.99, HTC Desire 555 $89.99, ZTE Blade X Max $99.99, iPhone SE 32 GB $99.99, Alcatel Idol 5 $119.99, iPhone 6 32 GB $199.99, iPhone 6 Plus 32 GB $299.99 when you port your number to Cricket. Unlocked Nextbit Robin 32 GB LTE Android phone (new) $124.99 Free shipping. TracFone Samsung Galaxy J7 Sky Pro (Verizon) 16 GB LTE Android phone with 1200 minutes, texts and MBs of data, one year of service, case and car charger $179.95 (reg $149.99 w/o airtime) free shipping. Four Lines of Unlimited for $100 Promotion: Four lines of the $50/month unlimited talk, text and LTE data plan for $100. Three lines are $90, two lines are $80. At least one of four lines must be a new activation. In stores only, rumored to be ending 12/31. Updated 12/29 Price cuts and new items since Sunday are in bold. I see LeEco is going for fire sale prices. On its way out. Following Nextbit Robin out the door. Probably, but the LeEco S3 Pro has a high end SOC, lots of RAM and unlockable bootloader and it's rootable. For someone into rooting and ROMing it could be a good deal. Nextbit is still hanging around, but under another name. No support for the Robin now, and they shut down the online storage for phone data, their big sell point. I think of the guy on the "All About Android" podcast who loved his Nextbit Robin to the point of not minding the 2 or 3 hour battery life. 'Other outstanding prepaid deals' lists the Moto G4 Plus 64GB at $169.99 with coupon, a very good deal. The list omitted the G4 32GB at $104.99. Is it really worth paying extra $65, 62% more for +2GB RAM, 3 extra MP (pictures still "mediocre"), a "bargain bin" fingerprint reader and +32GB storage? Maybe for some. I think most people would be more satisfied overall with a metal body G5 Plus, 2GB RAM 32GB (+mSD slot) for the same $169.99, or with a step further to the G5S Plus 32GB for the big screen, 3GB RAM, dual cameras, etc for $214.99. The G4 and G4 Plus are bland phones with plastic backs, and will be obsolete sooner. Maybe B&H agreed with this. They jacked up the prices on the G5 Plus and G5S Plus. Blandness and plastic backs come in 45th and 46th respectively on what matters with phone features. What matters is on the screen and inside the case. Plastic backs actually have some advantages: unlike glass, they don't shatter when you drop them 5 inches, they are lighter than metal, and they open up more wireless-charging possibilities. I had an old Galaxy S5 with a snap on plastic back. The design beats all the heavy metal and glass shatterbait I've seen since. I see the Moto E4 at Target for $59.99. Which phones are available for use on the Verizon MVNOs these days? Was thinking about Total wireless. Phones that work on Verizon MVNOs include fully paid for non-prepaid Verizon phones, Verizon Prepaid phones that have had their $25 -$100 ransom paid and universal unlocked devices like the Moto E4, G4, G5 series. The E4 will work on Verizon MVNOs if you pay Verizon's $75 ransom. If Total won't activate it, swap in a pre-activated SIM. tried that with an unlocked verizon prepaid moto g4, on tracfone verizon sim. left it on overnight, woke up the next morning to find that verizon had bricked the phone.when i got the e4 unlocked, i put in the apn sttings and it works fine on at&t or mint sim ( t-mobile). i will not use it on a verizon mvno. I just ordered the $79.99 Moto G4 Play from B&H and I'm going to put it on the free year with Sprint. I know everyone dogs Sprint's network but I have good luck with it where I live. Wife and I have that plan. You’ll love it. Sign up ASAP. This promo may end in Dec.
"Wife and I have that plan. You’ll love it." Most don't love it, but some do. Does Sprint's free year of service for switchers allow for switching from a prepaid mvno or does the account need to be a post-paid account being switched? (& byop). I switched one line from freedom pop, which was a Google voice number. Another line from consumer Cellular. Merry Christmas to you and yours, Dennis. Thank you for keeping this blog going. It's a great resource. Thank you and a Merry Christmas to you and your family and friends. Merry Christmas Dennis! Thanks for all the effort in keeping this great portal up to date. Merry Christmas Christine and Dennis! Thanks for all the effort in keeping this great site running and relevant and informative! Thanks, wishing you and yours a very Merry Christmas. Are those HSN Tracfone deals for new customers only? I have the Galaxy Sky from August, with plenty of credit left on the acct. These deals seem hard to beat for lite users that are not too worried about having a high-end phone. If I did not have 8 months and plenty of credit left from the other deal, I would buy this. That Snapdragon 625 is fairly fast and low power drain. Yes, you can combine the service days and balance from your current phone with the days and credits that come with the new HSN phone. See HSN.com, QVC, etc Bundle Activations for more information. So does the J7 Pro really have the SD 625? Most site say it is only quad core. It looks like the TracFone version of the J7 Sky Pro has a Snapdragon 425, not a 625. The 625 benchmarks about 30% faster than the 425. I've updated the post with the correct specs, thanks for pointing out the error.